Missed Nancy's webinar on "Curriculum: A GPS for Faith Formation"? Check it out here! 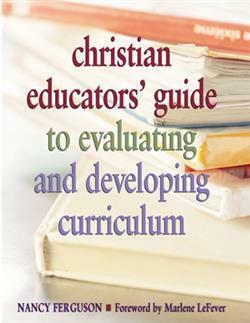 Reproducible worksheets throughout make this a highly practical resource for Christian education committees and teaching workshops. ERRATA: Please note that the book's list of curriculum publishers in the appendix did not include Congregational Ministries Publishing, Presbyterian Churches USA. We regret the oversight. Nancy Ferguson is a retired church professional with forty years experience in churches and camps. She is the former day camp director at Camp Hanover in Richmond Virginia and the project manager and editor of New Earth: Christian Resources for the Outdoors, an ecumenical curriculum for summer camps. Nancy is the author of eight books including Teaching Younger Children (Ages 7-10) About God's Creation, The Retreat Leader's Manual with Kevin Witt, Retreats for Renewal: Five Intergenerational Retreats, and Training Staff to Be Spiritual Leaders. Nancy is enjoying her retirement on the Eastern shore of Virginia near Chincoteague.